Above: Buzz Henry in the serial Tex Granger (Columbia, 1948). 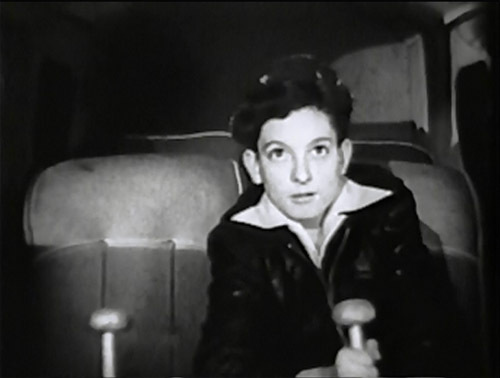 Buzz Henry, the last child actor to play prominent serial roles (in three of Sam Katzman’s early Columbia outings), projected a combination of competence and quiet enthusiasm perfectly suited to “kid sidekick” parts. His cheerful, thoughtful, and calmly self-confident demeanor, coupled with his nimble athleticism, made him come off as both a likable and valuable assistant to the hero, not just an annoyingly useless tagalong. Unfortunately, the serials in which he appeared were far less appealing than Henry himself was; all of his co-starring chapterplays were noticeably dreary and disappointing affairs. 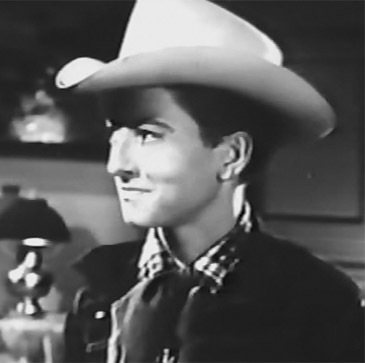 Robert Henry was born in rural Colorado, but grew up in California, where his mother ran a San Fernando Valley riding stable; he mastered the art of horsemanship at a very early age, and made his screen debut (billed as “Buzzy” Henry) before he was four years old, playing the heroine’s little brother in the 1935 Columbia B-western Western Frontier. He played similar child roles in several additional Columbia B-westerns in 1936 and 1937, then dropped out of the acting business until 1940, when low-budgeted Astor Pictures tried to turn him into a junior cowboy star by featuring him in a short-lived B-western series (two films in all). Henry followed these films with another starring turn in the PRC B-drama Mr. Celebrity, and then returned to B-movie supporting roles, playing helpful youngsters in multiple cowboy movies at Universal and Republic during the first half of the 1940s; he also took a couple of parts in non-Western B-pictures at PRC and Monogram. In between these film assignments, he performed with his horse Golden Pat on local rodeo circuits. Young Buzz (he’d abandoned his original screen nickname for this less childish variant in 1943) made the first–and worst–of his serials, Columbia’s Hop Harrigan, in 1946. A dull, poorly-directed, and poorly-scripted adaptation of a popular radio show, Hop starred William Bakewell as the titular pilot hero, and cast Henry as Jackie Nolan, the inventive, airplane-loving younger brother of heroine Gail Nolan (Jennifer Holt); the two siblings looked after Harrigan’s airfield base for him, and also assisted him in his conflicts with the mysterious Chief Pilot and the mad Dr. Tobor (John Merton). Bakewell’s Hop was an unusually passive and undynamic “hero,” while Holt’s Gail took very little part in the action, and Sumner Getchell’s comic-relief mechanic Tank Tinker was almost too dumb to live, let alone intelligently combat the villains; Henry’s alert and inquisitive Jackie was thus left to initiate many of the good guys’ moves, and resultantly emerged as the chapterplay’s most likable, active, and resourceful protagonist. One of his best moments came when he tried to fly a plane out of the dangerous mountains that surrounded Tobor’s hideout; without a word of dialogue, Henry made it clear through his facial expressions that Jackie was tense and nervous, but was also glorying in the sheer excitement of his emergency solo flight. Above: Buzz Henry takes to the air in Hop Harrigan (Columbia, 1946). 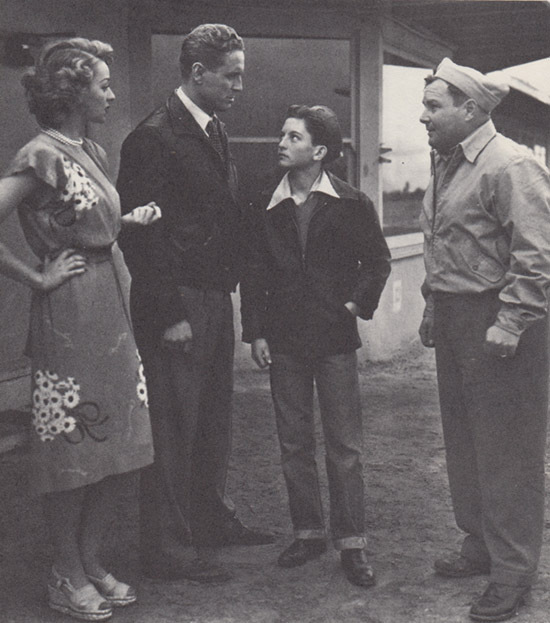 Above, left to right: Jennifer Holt, William Bakewell, Buzz Henry, and Sumner Getchell in Hop Harrigan. Buzz appeared in a second Columbia serial, Son of the Guardsman, before 1946 was over. Though not as bad as Hop Harrigan, this outing was still a misfire, an attempt at a medieval adventure saga that was crippled at the starting gate by producer Sam Katzman’s low budget and director Derwin Abrahams’ total unfamiliarity with the swashbuckling genre. Henry portrayed a seeming peasant boy named Roger Mowbry, who joined a band of Robin-Hood-like forest outlaws after his family was slain by the soldiers of robber baron Sir Edgar Bullard (Charles King); Roger eventually turned out to be the long-lost Prince Richard, the rightful king of England–and, with the aid of his outlaw friends and Sir Edgar’s heroic nephew David Trent (Robert Shaw–not the British actor), was helped to his throne despite the opposition of Sir Edgar, the Duke of Hampton (John Merton), and other usurping nobles. Though his character was pivotal to the plot, Henry didn’t receive as much screen time in Guardsman as he had in Hop Harrigan, since he was only one of a group of sidekicks (the outlaw band). However, he was again likably chipper and capable, coolly using a slingshot to fell various villains during the serial action scenes–and delivering his lines without any of the self-consciousness that marked some of the older players’ performances. 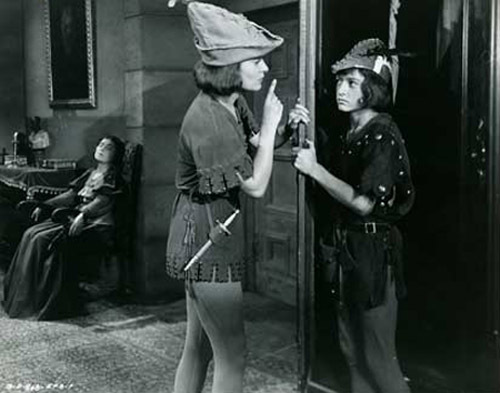 Above: Buzz Henry helps disguised heroine Daun Kennedy make an escape in Son of the Guardsman (Columbia, 1946); Belle Mitchell is dozing in the background. 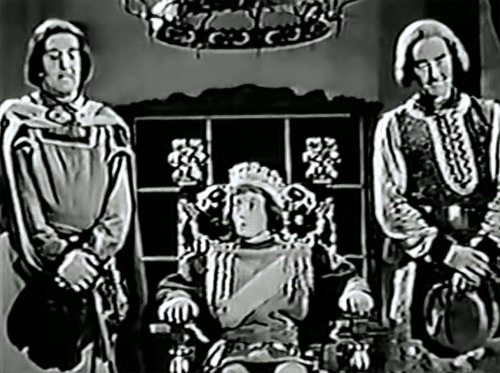 Above: Buzz Henry is about to issue his first royal decree at the end of Son of the Guardsman; Ted Adams is at right, Wheeler Oakman at left. Henry continued to balance rodeo work with (increasingly sporadic) acting appearances during the remaining years of the 1940s; he took major roles in about half-a-dozen more B-films (for Universal, PRC, Lippert, and Columbia), played bits in a couple of A-movies, and took on a last kid-sidekick role in the serial Tex Granger (Columbia, 1948). The most watchable of Henry’s chapterplays, Granger benefited from a very strong cast and nice location shooting, but was undermined by weak action scenes, dull plotting, and a slow pace. Robert Kellard starred as Granger, a frontier newspaper editor who doubled as a masked rider; Buzz was cast as Jimmy Perkins, a youngster who’d made a long journey West in hopes of finding his missing father, and who became one of Granger’s chief allies in his fight against a crooked town boss (I. Stanford Jolley) and an equally crooked sheriff (Smith Ballew). As in Son of the Guardsman, Henry’s character eventually turned out to be a long-lost heir; Jimmy’s late father was ultimately revealed as the real owner of all the frontier property controlled by Jolley’s villain. Henry, now seventeen and a little too old to be entirely believable as the pre-teen boy he was supposed to be, was more subdued than he’d been in his previous serials, and at times seemed somewhat embarrassed by his more emphatically juvenile lines. However, he still displayed some of his accustomed chirpiness on several occasions, particularly when he was good-naturedly bantering with Kellard and with leading lady Peggy Stewart; he also carried off innumerable riding scenes with graceful assurance, and retained all of the understated confidence that’d marked his earlier chapterplay performances–making it very easy to believe that his character had decided to trek West on his own, and had managed to survive the trip. 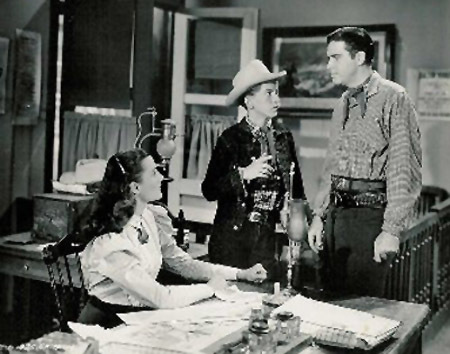 Above: A worried Buzz Henry reports to Peggy Stewart and Robert Kellard in Tex Granger (Columbia, 1948). 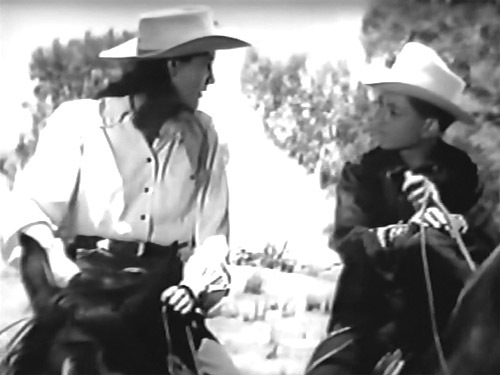 Above: Peggy Stewart and Buzz Henry confer on horseback in Tex Granger. From 1950 onwards, Henry eschewed acting for a very successful career as a stuntman–although, like most stuntmen, he took minor acting roles on a regular basis, including a miniscule bit as a henchman in the serial King of the Congo (Columbia, 1952), and a more noticeable bit as a wounded Indian named Orco in the serial Man with the Steel Whip (Republic, 1954). Henry became Glenn Ford’s regular stunt double at MGM during the mid-1950s, and by the early 1960s had established himself as one of Hollywood’s leading stuntmen; he not only performed stunts, but coordinated them as well, serving as a second-unit director on many big-budgeted films (including The Wild Bunch) during the 1960s and early 1970s. He was on the verge of becoming a full-fledged director for Universal producer Saul David when he was killed in a car accident on Forest Lawn Drive in 1971. Buzz Henry’s agility and controlled energy made him a better fit for the chapterplay genre than any child actor since Frankie Darro; thus, it’s more than a little frustrating that he was exclusively relegated to the sluggish serials of Sam Katzman’s early post-war period. Although he was born too late to serve as a sidekick in any of the chapterplays of Mascot or golden-age Republic, he often evoked the cheerily adventurous spirit of those earlier and more exciting productions. 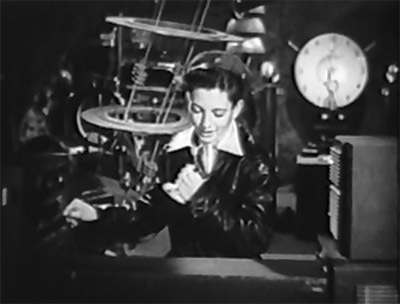 Above: Buzz Henry makes a radio call from the heart of Dr. Tobor’s hidden laboratory in Hop Harrigan (Columbia, 1946). Acknowledgements: Former B-western heroine Martha Tibbetts’ reminiscences about Buzz and his mother, given in an interview published in Michael Fitzgerald and Boyd Magers’ Ladies of the Western (McFarland, 2006), provided me with much of the biographical information in this article. Jim Ryan’s The Rodeo and Hollywood: Rodeo Cowboys on Screen and Western Actors in the Arena (McFarland, 2006) was also very helpful, while Peter Ford’s Glenn Ford: A Life (University of Wisconsin Press, 2011), a 1941 item from the Wilmington Star, a 1969 blurb from the Toledo Blade, and a thread on the Internet Movie Database provided me with details on Henry’s pre/post-serial activities.